In 2013 Wellspan Health Selected electrical contractor G.R. Sponaugle to perform the highly technical Emergency Power Systems Upgrade project at the York Hospital. In early 2007 construction began on the immense FGD project at Brunner’s Island. Flue gas desulfurization (FGD) is a technology used to remove sulfur dioxide (SO2) from the exhaust flue gasses of fossil fuel power plants. Fossil fuel power plants burn coal or oil to produce steam for steam turbines, which in turn drive electricity generators. In 2002 Edwin L. Heim Electric Co. teamed up with IBEW 229 to install the electrical systems during the construction of the York Hospitals Patient Care Tower. Construction lasted nearly 3 years with the final product being a 6 story state of the art patient facility for heart,orthopedic, and maternity patients. A state of the art Heart Cath Lab was installed as well. This project is another showcase of the extreme professionalism of the IBEW Local 229 electricians and the NECA team. We are proud to have been a part of this York County landmark. 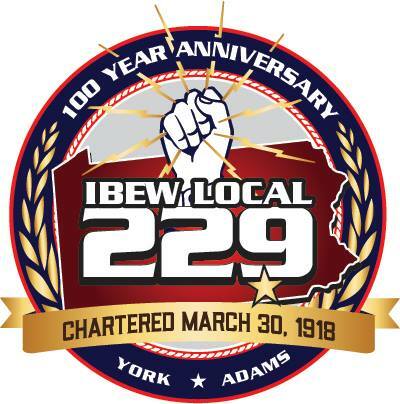 In 2010, IBEW Local 229 electricians employed by York, PA Electrical Contractor Jno. Z. Barton Inc. performed the complex electrical construction on the state of the art Uni Life Medical Solutions building in York, PA. Uni Life produces pre-filled medical syringes and other devices critical to health care. The electrical systems included but are not limited to power and controls for truck docks, general power and lighting, and fire alarm. Hunterstown plant is natural-gas fired, combined-cycle power plant with capacity rating of 839-megawatts. It is located on 89 acres in a brownfield industrial site in Straban Township, Adams County, Pennsylvania. The facility includes three state-of-the-art combustion turbines and three heat recovery steam generators with selective catalytic reduction. The plant utilizes a dry-cooled condenser to minimize groundwater usage from on-site wells. The facility began commercial operation in 2003, providing electric power to PJM Interconnection.